Six-week-old Faith Lovemore died after her mother, Julia, stuffed bits of Bible pages into the baby's mouth and sat on her. A judge says she was "profoundly mentally disordered and suffering from religious delusions at the time." Yeah. 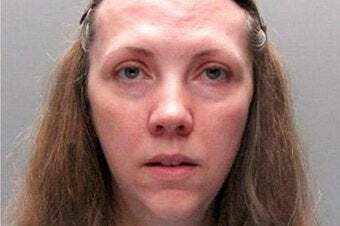 Julia Lovemore, 41, has been detained indefinitely under the mental health act after admitting the manslaughter on the grounds of diminished responsibility after her lawyer described her as being in "a florid state of psychoses" at the time. She suffers from bi-polar effective disorder and has suffered at least three psychotic episodes; the judge ruled that this caused "grandiose delusions of special powers, religious delusions of identity and auditory hallucinations." The day of the killing, both a social worker and a psychiatric nurse had visited the home because, authorities had been concerned about the behavior of Lovemore's husband David, 39 - "also a mentally-ill religious fanatic", the court heard." There had been previous reports of Julia hitting her elder daughter with a hairbrush, and the children were on the "at risk" register. In February 2009, a psychiatrist described Julias as "at high risk" of another psychotic episode. When social workers arrived, they found the father "praying loudly and shouting 'Take the devil out of Julia.'" Feeling they were making the man more agitated, (and presumably concerned for the older daughter) they apparently went to get backup - and a few hours later, David carried the baby's body into a surgery. It's thought Faith was already dead in the other room at the time of the visit. The prosecution has suggested that the couples' extreme religious beliefs, in combination with their mental illness, made for an especially dangerous atmosphere, saying, 'With hindsight it was judged both parents were deteriorating sharply. Profound mental ill health and engagement with religious beliefs turned out to be an explosive cocktail." The social workers had been considering an order of protection when they visited the home; tragically, the intervention came too late. An independent probe has found that social workers "underestimated" the parents' illness and that "the link between [mental illness and religious extremism] was not sufficiently articulated." However,the Cambridgeshire Local Safeguarding Children Board Vice Chairman defends their social workers, saying it was an exceptional situation with a tragic outcome. "The circumstances around this death were exceptional. There were complex issues within the family around mental health, and the practice of their religious beliefs." While it would be a mistake to ascribe the tragedy to religion rather than mental illness, it's interesting that authorities are applying special scrutiny to the intersection of mental illness and religious fervor: in combination, these things can indeed be a red flag. According to the Daily Telegraph, when social workers initially met with David Lovemore for assessment in 2009, "when he was asked what he would do if Faith or her sister got into difficulty he said he would pray first. He never said yes or no to calling a doctor." Additionally, Julia's aunt told authorities that her niece's "religious fervor" had distanced her from her family, whom she denounced as "heathens." In combination, these things cannot be dismissed as "the practice of religious beliefs" - at least not where children's welfare is concerned.